Budgeting and saving money is a year-round endeavor for me. Each month, I try and find ways to be more frugal and simplify my lifestyle. By doing so, I am able to put money away each month for the biggest spending of the year – Christmas time (At the end of every S.O.S. article, I list the savings I have accrued each month). This month, I made the decision to make some meals ahead of time and freeze them for later use. I had many of the ingredients in my refrigerator already, so going to the store to purchase the additional food ingredients did not affect my monthly budget. In addition, there were some items where the store was advertising a deal, such as, buy one, get one free. 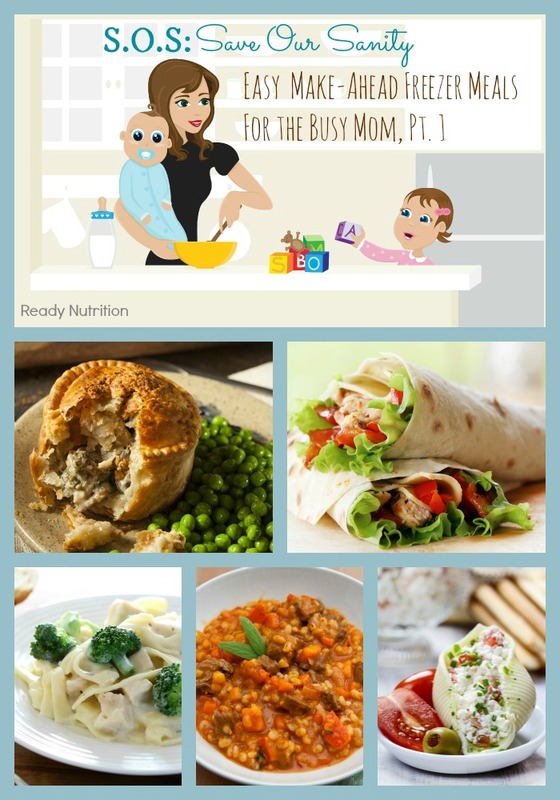 This will help me in future meal planning and I saved money at the same time. Recently I came across a website that challenged the readers to make 50 freezer meals in one day. I have never been one to shy away from a challenge, so I set out to conquer. I wish I could tell you that I was victorious, but I wasn’t – not anywhere close; however, not all was lost because I did make some incredible meals. I am a big believer that I am not unique, and I would be willing to bet that a few of you out there may have a hard time setting aside an entire day to make close to two months worth of meals. Like me, you could probably complete it over a period of two weeks devoting just a few hours a day to making the meals, right? 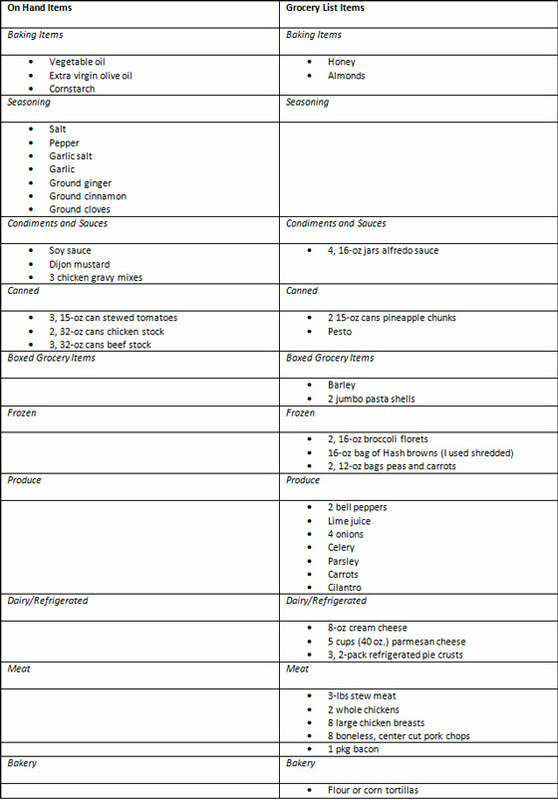 I have broken the freezer meals that I chose to prepare down into a two-week plan that has 7 recipes a week and includes an organized grocery list for each week. Each recipe grouping includes how much time it took me to prepare. On Day 1, I started the meal preparation by roasting the two whole chickens and pat it dry. (Recipe is below.) While the whole chickens cooked, I prepared (3) of the Crock Pot Beef and Barley Stews and (2) Crock Pot Chicken Broccoli Alfredo because they are dump and go. When I finished preparing those, I started making the (2) Honey Lime Chicken meals, and my family enjoyed one of those that night. Lastly, I shredded the oven-roasted chickens and placed the meat into a gallon Ziploc bag for Day 2. Preheat the oven to 425 degrees. Discard the chicken giblets and rinse the interior and exterior of the chicken. Add salt and pepper to the interior chicken cavity, and then cut a large lemon in half and then quarter it. (Reserve the second half of the lemon for the second chicken breast.) Place the lemon and five peeled garlic cloves inside the chicken’s cavity. Slip wedges of non-salted butter underneath the skin of both sides of the chicken, and then drizzle extra virgin olive oil on top of the skin. Sprinkle the top with salt and pepper. Place the chicken inside a roasting pan and cook. Cook the chicken until the juices run clear or the internal temperature has reached 165 degrees. Place all ingredients in a large crock pot and stir. Cover and cook on low for 8 to 10 hours or 4 to5 hours on high. Place all ingredients inside a gallon size freezer bag, and then label and freeze. When you want to cook it, defrost it, add it to a crockpot, and follow the cooking instructions above. Place all ingredients in a large crock pot and stir. Cover and cook on low for 6 to 8 hours or 4 to 6 hours on high. Place all ingredients inside a gallon size freezer bag, and then label and freeze. When you want to cook it, defrost it, add it to a crockpot, and follow the cooking instructions above. Serve over linguine pasta with a fresh Italian-style garden salad and breadsticks. Dice the chicken into one-inch cubes and season with garlic sauce. Next heat vegetable oil in a skillet over med-high heat and then add the chicken and cook until it is golden brown. While the chicken is cooking in the skillet, drain the pineapple and reserve the juice. Add ¼ cup of the pineapple juice to the skillet, cover and simmer for 6 to 8 minutes, and then remove from the chicken and pineapples from the pan. Add honey, lime juice, soy sauce, cornstarch, and the remainder of the pineapple juice to the pan, and bring the mixture to a boil while stirring constantly. When the mixture has thickened, reintroduce the chicken and pineapple back into the pan and heat through. Serve with hot rice and garnish with lime wedges or Chow Mein noodles. Once the cooked honey lime chicken has cooled, add it to a gallon size freezer bag, and then label and freeze. When you want to cook it, just defrost it, add heat, and serve with fresh hot rice. On Day 2, I retrieved the gallon Ziploc bag of shredded chicken and prepared (3) Chicken Pot Pies, the (2) Pesto Chicken Stuffed Shells, and (2) Cilantro Lime Chicken Tacos. In addition, I boiled down the two chicken carcasses and made homemade chicken soup. Preheat the oven to 350 degrees. Mix the shredded chicken, potatoes, onion, frozen peas and carrots, and gravy in a large bowl. Lay the bottom pie crust layer in each of the 3 disposable pie tins and place the chicken mixture on top of it. Add the top pie crust layer to each pie tin and crimp the edges where the two pie crusts meet. (Note: You can save the excess pie crust to add to a Chicken and Dumpling recipe later.) With a knife, slice a few holes on the top of each pie. Place in the oven for 35-45 minutes until top is golden brown. Cover the disposable pie tins with foil, label, and then freeze. When you want to cook it, just defrost it and follow the cooking instructions cited above. Note: Does not include time roasting or shredding the chicken meat. Bring a large pot of chicken stock and water to a boil, add the package of jumbo pasta shells to the pot. Cook pasta shells until they are al dente (about 6 minutes), drain, and set aside. In a large mixing bowl, combine the cream cheese, parmesan cheese (reserve ¼ cup of parmesan cheese for topping), pesto, cooked chicken, garlic, sun-dried tomatoes, salt and pepper and mix thoroughly. With a small spoon, stuff the pasta shells with the chicken mixture and place in a 9×13 disposable foil baking tin. Add the reserved ¼ cup of parmesan cheese to the top of the stuffed pasta shells. Preheat the oven to 350 degrees and bake the pasta shells for 30 minutes and the cheese turns a golden brown. Season chicken with garlic salt and pepper and set aside. Prepare the cilantro lime pesto. Combine the cilantro lime pesto and the shredded chicken, fill the tortillas with chicken and top with preferred garnishes. Place the seasoned chicken meat in a small freezer tin or quart-sized Ziploc bag. (I used a mini loaf bread tin.) Next place the cilantro lime pesto in a separate Ziploc freezer bag. Label and freeze with each other in the separate bags. When ready to eat, defrost the pesto and the chicken and heat the chicken. Add the chicken to the pesto sauce and serve with the preferred garnishes as stated above. Note: Does not include time roasting the chicken. Cover the chicken carcasses with water and bring to a boil. Add the celery, carrots, onion, garlic, parsley, thyme, and pepper. Cook for two hours. Discard the bones, celery segments, parsley and thyme. This can also be used as a base for chicken and rice soup and chicken and dumplings. Place the cooled soup into a freezer-safe container. When needed, thaw and reheat. On Day 3, I took it easy and made the last meal for this week’s cooking. Heat the extra virgin olive oil over medium-high heat. Season the pork chops with salt and pepper and cook for 2 minutes on each side or until browned. While the pork is cooking, combine the remaining ingredients in a bowl and set aside. Reduce the heat to medium-low and add the honey mixture to the pork and cook for 5 minutes on each side until done. Remove the pork from the skillet, allow the sauce to boil until thickened, and slightly reduced the temperature and let the mixture cook for an additional 3 to 5 minutes. Spoon the glaze over the pork before serving. Brown the pork as directed above. Once it is browned, remove the pork and allow it to cool. Place the cooled pork chops into a Ziploc freezer bag. add the remaining ingredients to the bag, label, and freeze. When ready to cook, defrost and place the mixture into a crock pot, cover, and cook on low for 4 to 6 hours or on high for 3 to 5 hours. At the end of Day 3, I had cooked 9 recipes and created 18 meals – not too shabby. Next week stop by for Part II. Happy cooking!